It used ARTEX to explore the potential of computer networking for the interactive, collective creation or ‘distributed authorship’ of an artwork by remote participators. Roy Ascott’s 1980 telematic artwork, La Plissure du Texte (The Pleating of the Text) explored the potential of computer networking for the interactive, remote, collaborative creation of a work of art that challenged the conventional aesthetic categories of artist, artwork, and viewer, and the traditional opposition of subject and object. Eleven locations in the US, Canada, Europe, and Australia, each representing a character (magician, princess, beast, etc. ), participated in the “distributed authorship” of a “planetary fairytale” by collectively creating and sharing texts and ASCII-based images (see left) that comprised the unfolding narrative. As its title suggests, the work riffs on Roland Barthes’ Le Plaisir du Texte (1973), in which the literary theorist proposed “the generative idea that the text is made, is worked out in a perpetual interweaving … [such that] … the subject unmakes himself, like a spider dissolving in the constructive secretions of its web.” (Ascott, 1984). La Plissure du Texte similarly emphasized the “generative idea” of “perpetual interweaving,” but in a way that contests conventional subject-object relationships even more profoundly because the work is not the product of a single author but is pleated together through the process of distributed authorship. For Ascott, moreover, there is no finished work, no final outcome, per se; rather, the work consists of the process of distributed authorship, which provides a working model for experimenting with and potentially experiencing forms of telematically-enhanced, collective consciousness. For more on Ascott and Telematic Art, see Roy Ascott, Telematic Embrace: Visionary Theories of Art, Technology, and Consciousness, ed. and with an introduction by Edward A. Shanken. Berkeley: University of California Press, 2003. See also Shanken's essay, "Telematic Embrace: A Love Story?" 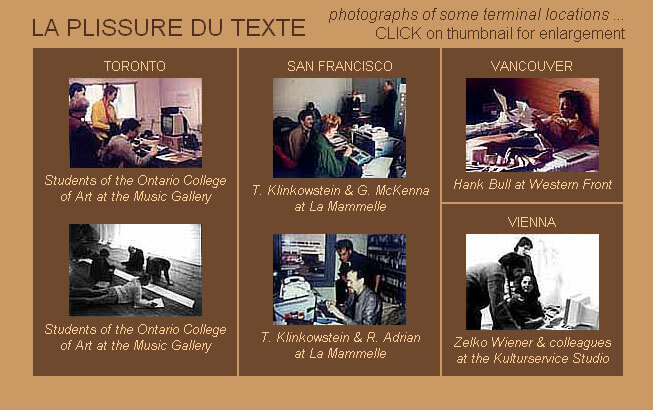 and the online documentation of the exhibition, Telematic Connections, curated by Steve Dietz, 2001.